We’re always excited when a booking comes to us at this venue. 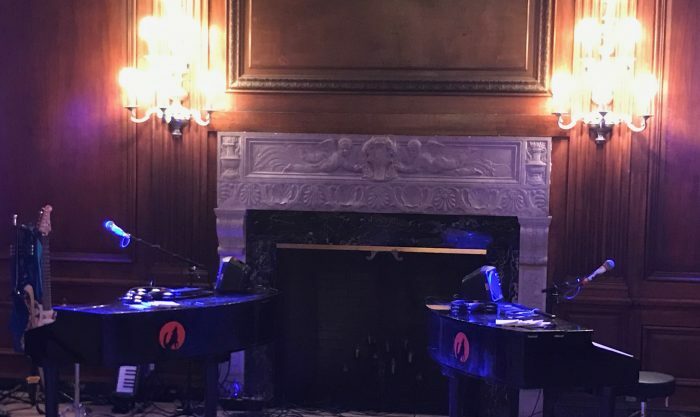 Bringing our Dueling Pianos show to the University Club always guarantees a great time. Our most popular shows at this venue, are certainly wedding afterparties! After the main festivities of the day are over, you and your guests really want to let your hair down! Why not add an afterparty to the day. Usually, these run from 12am – 2am for the real night owl partiers in your group. We still take requests and, for those still standing, there’s no better way to round off your perfect wedding day! This venue has a variety of rooms available for use, and their informal lounges provide a perfect space to party late into the night. We are the number one choice to perform these at all Chicago weddings, and we’d love to see you there! The University Club of Chicago is an amazing club that defines itself by the connections that members are able to make. Members find a home at this club, among other driven, successful people in the community. The building itself is the perfect location for a variety of different events, including weddings, social events, birthday parties, retirement parties, corporate events and more. This breathtaking facility serves as the perfect backdrop for the most memorable times of your life. On top of all of this, the University Club of Chicago also has amazing cuisine! If you are looking to stay in peak physical shape, University Club of Chicago is home to a golf center, squash court, workout facility, pool and more. Whether you are looking to socialize, stay in shape or host the most important events of your life, University Club of Chicago is the perfect location.